Coming back to Arangetra Velai, I do admit, there were some funny scenes like "Saar laaddoo" by the office peon and the telephone sequences by the loud VK Ramaswamy, still I am discouraged to call it a good comedy movie. Comedy in the nineties merely meant loud dialogue deliveries, beating up someone and making cheap mockery of something or someone. movies. We had fun watching paatti sollai thattaadhey and Aburva Sagotharargal.We did enjoy watching Guru Shishyan and various other rajini movies which were mostly illogical but had humor in them. Paatti sollai thattaadhey was merely a children's movie. so nothing much to write. we were children and hence we enjoyed it. Aburva sagotharargal had so many nice things about it. The midget kamal, manorama's hayyiyyo hayyo, hayayayyo, saar, neenga engiyo poitteenga by the jalra of janakaraj, a fresh way to narrate a known story, tricks followed to finish the villans and last but not the least, beautiful songs by IR. I would still love to watch this movie even if it is for the nth time. Recently, during our vacation me and my husband were travelling from Pazhani to Madurai in a DVD Coach bus and we were still enjoying this movie amidst the crowd. It is sheer fun. Then comes the Baap of all Comedy Movies. Micheal Madana Kamarajan. Thanks to Crazy Mohan for making this a lively laugh riot. Each and every dialogue in this movie had some comical ingredient in it. I still remember the time when we went walking all the way fromChrompet New Colony to Vetri theatre to watch this movie. Mother took me, my sister and my grandmother to this movie. While returning we sisters were discussing about the movie. As children, we could hardly understand the movie. It was haphazard with so many kamalhassans in it. But it totally left us astonished about the fact that kamal has expressed himself in four distinct ways and was quite good with it. We were giggling on the funny accent of Palakkad Kameswaran and Tripurasundari. I guess we had seen the very first version of this movie. When it was released it was too lengthy and cumbersome. Many scenes were confusing and shortly after, they released the next version. The second version was prepared by a good editor(i cant recall the techincalities of film making then) who edited the long sequences and made the movie crispier with an understandable story line. After watching this movie two to three times we understood the story of this movie to a fair extent. All of us must have seen this movie atleast once. So I will skip the story of this movie. I am going to only write about the funny things that I liked about this movie. Kameswaran - kamal's clean shaven face with a strip of sandalwood paste, single rudraaksh in his neck, white shirt and mundu with a cotton towel on his shoulder is such an apt description of anyone roaming about in the streets of palakkad. He couldve worked on the pronunciation part(esp the yettaiya part. it is colloqially said as kittiyaaa with a stretch in the aa part but i found it as a shortcoming in kamal's practice only after moving closely with my in laws. for anyone else it is alright.) but neverthless his attempt was gracious. His intonation, articulation and modulation is superb. 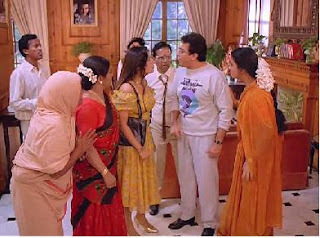 My favourite scene is when kamal comes looking for urvashi's granny " aaradhu aathile? aaravadhu irukkela ille illiyaa?" "yey thirppu nee varandaam, gnaan unnai pakka varalai, un paattiya koopudu, enge paiyellam eduthundu poraai?" This is just one scene but we are caught up between two profound artists because we get confused who to look at as both of them have worked so wonderfully that even if we miss for a second, we will forego a joke.Expressions, Actions, Body Language, content, dialogues what to mention in this scene.. everything is a rib tickler. I was surprised when Mahesh said the above words in a voice chat recently. So everyone thinks the same huh? Kamal's experiment as a Palakkadaan had worked out magically and I dont remember seeing any actor try to perform like a palakkadaan. The last thing I watched and registered a good Malayalee performace was from Muthuraman in KB's Edhirneechal as Nair. That is it. Kamal's screen presence in this movie is so powerful that we start smiling the moment we see kameswaran on screen. 2. Meeting Crazy Mohan in the provision store and going to meet tripurasundari at her home. their marriage is fixed here and sundari neeyum song. 3. marriage scene where avinasi sees kameswaran in janavasa oorvalam and stays with him in his first night. 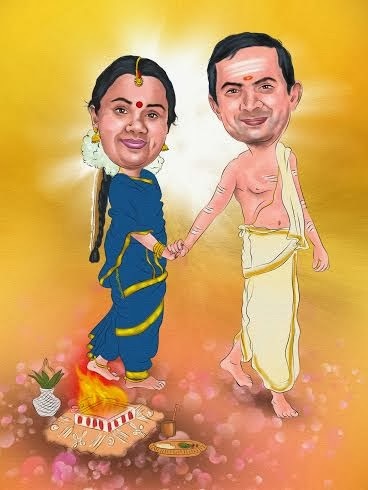 4. the couple goes to bangalore for honeymoon along with thiruttu paatti and subsequent funny scenes. I cant stop laughing when Kameswaran takes varadhukutti to Crazy Mohan's grocery shop and Varadhu asks for pullippu mittai. Kamal says, "ennada gharbhastri mashakkaiyaattam eppo paaru pulippu mittai? poi appavai kootindu vaa.. (putting the list on his shoulder)pulikku puli pazhikku pazhi.. naanum rowdyakkum kettela? " LOL.. The famous lines, "enakku amma adaiyaadhu (as he says it) akka adaiyaadhu, thangai adaiyaadhu, aarungadaiyaadhu. enakku therinjadhallam engappa, samayalkattu, pogai, varadhukkutti ippo nee" This was highly popular at school. ennadhu kattindrukkom? by urvashi and the aamaam by kamal is legendary.. we cant miss a dialogue of these two because it is all so funny. 2nd interesting character in this movie is obviously Nagesh who has acted as the greedy avinasi. just before the climax, avinasi asks kameswaran to recite the dialogues that he needs to talk to bhimboy. kameswaran innocently takes out a paper and murmers something. avinasi tries to hear it closely but in vain so he asks"ennadhu paper ellam vechundu padikkaraay" kameswaran says ,"adhula pottrukkumaakkum" avinasi gets highly irritated and shouts.. "aama, ellaathukkum oru aakkum serthukko".. hilarious another joke is when paatti suddenly hikes the cost saying "idhu benglooraakkum, inge vela vaasi yellam jaasti, nokku vendaam na naangal poidrom" avinasi's reaction is enjoyable. "unnai madiri oru paati irundha porum en 8 pongalukkum orey medaiyila kalyanam panni irukkalam". 3rd interesting character in this movie is thirupurasundari's thiruttu paatti. kamal has some affinity towards S N Lakshmi. we have seen her as a mother in server sundharam as well. she has acted in many other movies. but still her performance as a mother in law in mahanadi and thiruttu paatti of thirupurasundhari in MMK has secured her a place in the history of Tamil Cinema. For her age, she is highly active. In climax "enna kariyara naatham" and realises that it is her saree that is burning she jumps up and down tickling us altogether. For some strange reasons, she seems to be disliking venniraadai moorthy who tries to talk to her. Manorama acts as a greedy drama actress who wants to get her daughter married to this posh guy madan. In the climax, when Khushbu asks what is the proof that you are madan's finace, manorama would say, "sakku soopinchu"with an agmark telugu accent. Each character in the movie is creative including the pathan who comes for recovering his debt, the two guys who work for nasser(crazy mohan's team mate Venkat and Ponnambalam the famous stunt man), the funny father character of all the four kamalhassan who tries to make tea in the tea estate, venniraadai moorthy for his weird expressions, varadukkutti for scratching his underarms often, delhi ganesh for his natural accent, santhana barathy for his overall body language, manorama for her greed and so on. Bhim - the loyal body guard of Madan (body without brains) who carries out whatever is instructed to him. wondering how they selected this name bhim boy which entered the history shortly. This name was so damn popular at school within 2-3 days and it remained so for quite sometime. And thus, this movie DVD remains in my cupboard forever. I dont get bored inspite of watching it numerous times. I know the dialogues word for word, still cant help watching and enjoying the performaces of Kamal, Urvashi, Nagesh, SN Lakshmi, Venniraadai Moorthy etc. In our family gatherings, a scene from this movie is a must for sumptuous laughter. A Grand Laughter Treat. I am going to watch it for the nth time now..
நான் மிகவும் ரசிக்கும் படங்களில் ஒன்று இந்த ‘மைக்கேல் மதன காமராஜன்’. மிக அழகாக காட்சிகள் கோர்க்கப்பட்டு இருப்பதும், அடுத்தடுத்து கமல்(கள்) seamless-ஆக அறிமுகமாவது இன்று கூட எனக்கு ஆச்சர்யத்தை தரும். The best என்று பார்த்தால் அது ‘காமேஸ்வரன்’ தான் & அவனுக்கு சரிக்கு சரியாக நிற்கும் ராட்சஸி ‘ஊர்வசி’. ஒவ்வொரு முறையு பார்க்கும்போது காட்சிகள் புதிது புதிதாக தோன்றும் மாயாஜாலம் ‘கமல் - கிரேஸி’ கூட்டணிக்கு மட்டுமே சாத்தியம். :-) thanks for the comments, Mahesh. Nice outlook. கமல் கிரேசி மோகன் கூட்டணியின் மிகபெரிய வெற்றிப்படம். முதலில் பார்க்கும் போது எனக்கும் மொக்கைப்படம் மாதிரி இருந்தது, மீண்டும் பார்க்க பார்க்க ஏதாவது ஒரு காமெடி தெரியும். அருமையான படம். சென்னையில் வேலை செய்த காலத்தில் கிரேசி மோகன் அனைத்து ட்ராமக்களையும், ராணி சீதை மன்றத்தில் சென்று பார்த்துவிடுவேன். இங்கு வருவதற்கு முன்னர் கூட சேலம் வந்திருந்தனர். சாக்லேட் கிருஷ்ணா டிராமா பார்த்துவிட்டுதான் வந்தேன். இன்னும் இவர்கள் கூட்டணியில் படங்களை எதிர்பார்கிறேன். கார்த்திக், நானும் சாக்லேட் கிருஷ்ணா பார்த்தேன். 2008 வெகேஷன் ல மயிலாப்பூர் ஃபைன் ஆர்ட்ஸில். ரொம்ப பிடித்து இருந்தது.